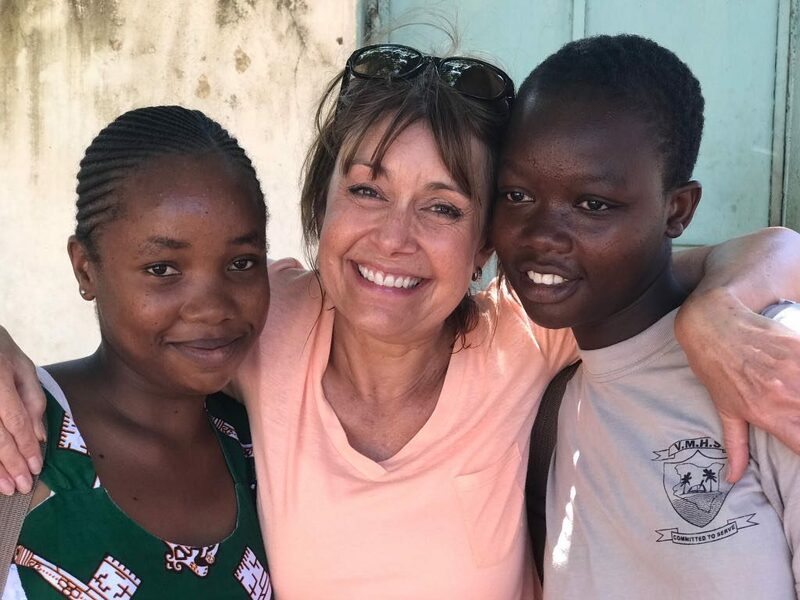 Fiona Watts (above with Zawadi and Lucy, the children she sponsors) used to live in Ilkley in Yorkshire. About four years ago, she saw the Singing Kids on tour and discovered that her best friend had some of the children staying at her house. One thing led to another and Fiona started sponsoring some of the kids. What was your first impression of Kenya and the school? “I had visited Kenya before so I knew a little bit about the level of poverty, but I didn’t realise that so many young children just don’t get any education unless their families can afford it. It was a real eye-opener to see how important education is for them. “The school has a family feel: all the children look out for each other. It’s a lovely atmosphere. The children we sponsor didn’t know we were coming and they were, literally, in tears when they found out who we were. They were genuinely blown away and so, so grateful, saying, “thank you” over and over again. How poor are the people you met in Kenya? “There are not enough jobs in the country, many of the children at the school have older siblings not working, many don’t have both parents. Because they are so poor, if someone is ill they can’t afford a doctor and therefore they just die, often from HIV and other diseases. Malnutrition is rife; the diet is basic, but they do their best in conditions that can be insanitary and they are very proud of their kids and make sure they go to school clean and tidy. It’s a totally different level of poverty than anything we experience here in the UK. Things conspire against them at all levels. How do the children cope with the difference when they come to the UK? “It’s fantastic to see how happy and cheerful, and how resilient, these quite young kids are when they come to what is, for them, a totally foreign environment. Given everything I’ve said above, it’s amazing that they cope so well. “That said, you can take the kids out of Kenya but you can’t take Kenya out of the kids. To illustrate what I mean, when the choir were over this time and we had some of them staying with us, I was cooking and a nine year old came in and started helping. She told me, ‘I have to do this at home.’ Our British nine year olds would never think they have to cook, and even if they did they would not know how. “I think that one of the great things about their trips to the UK is they get a chance to be children, as we would understand it. They have such a hard time at home, but here they are exposed to scooters, bikes, Lego – things that are beyond their normal experience. If you had a few minutes to tell someone why they should support Educate the Kids, what would you say? “I don’t think people realise how inexpensive it is. It’s only £11 to sponsor a child for a month – many people in the UK would spend that on a cocktail. I was in London recently and was charged £15 for a G&T. I felt almost sick, thinking about what that money could do in Kenya. “The great thing about Educate the Kids is that small amounts of money make such a difference. Unlike bigger charities, every single penny goes to the children. Big charities’ staff are paid to go abroad for their work: Educate the Kids supporters and those who run the charity all pay themselves for their trips to Kenya, and for everything else. And it’s not just helping them at school. I remember one of the kids wanted to be a qualified hairdresser and her brother a qualified electrician. One of my friends who supports Educate the Kids asked now much money their training would cost. It was about £200 each. Compare that to the £9,000 a year it costs for university fees here! Without help they have no chance of raising this money in Kenya – there are no grants or student loans there. Finally, please realise that without our support – the education and the meals they receive at school – some of these children, especially those at the orphanage, would not be here, by which I mean some kids, like young Andrew whom I met when I was in Kenya, would probably not survive.